How to find healthy options when eating out? We often stop for coffee when shopping at a mall and want a quick bite with it too. And we often fix meetings at some approachable cafe or tearoom. The most important question that comes to mind in such situations is, how one chooses what to eat? All the popular options seem to be laden with junk, drowned with sugar laden sauces and trans fat based creams and what not. Although I don't see any harm if one eats such foods once in a while but if you are someone who has to depend on cafe foods in everyday life it is better to look for options that work for everyday eating. I know a few people who have to eat in cafes at least once a day and this bit of my post is intended for them. I would recommend you search for that small section of the menu that lists salads first. 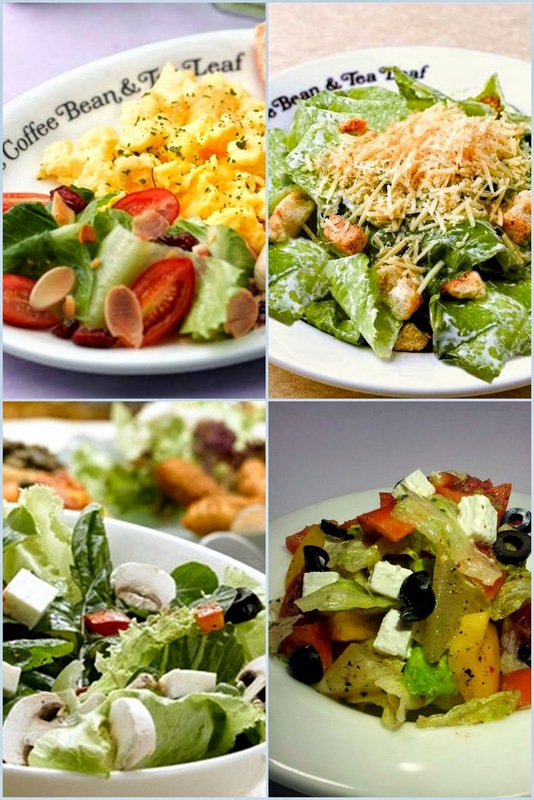 I am glad with the increasing trend at most cafes to include a good salad in the menu and they almost always customize the salad as per demand. 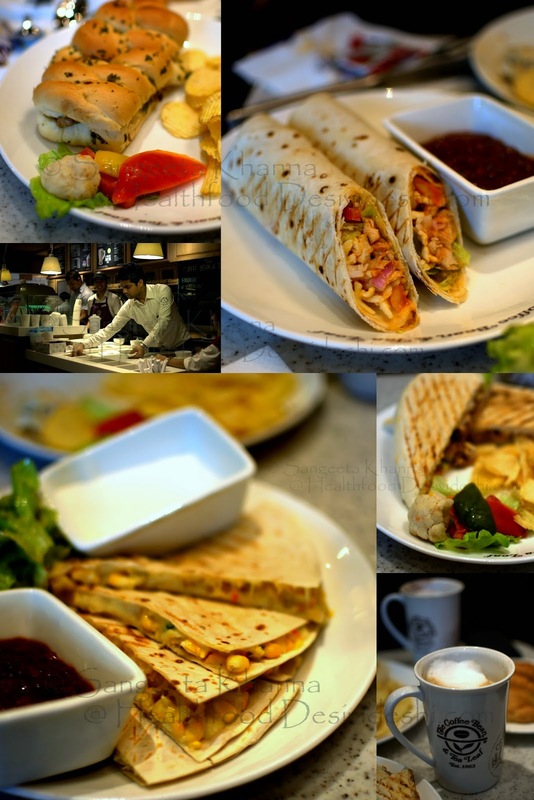 Here is what I found at Coffee Bean and Tea Leaf recently when we were at Select City Walk, Saket for some gifts shopping. We tried a couple of sandwiches too to see if they are worth, I was glad both sandwiches came with a helping of green salads on the side and the chicken panini sandwich was good for a filling bite. I found the Mushrooms sandwich a bit unbalanced, too little filling in too thick a bread (a challah) and that makes a sandwich insipid for me. You can always ask for the kind of bread being used for a sandwich if ordering one, opt for the thinner, lighter breads. Wraps and Quesadillas are better options if you want a filling snack to share or a meal for yourself. I found the Corn and cheese Quesadilla quite good and tasty and it came with a side of salad too. Good nutrient value for the calories consumed. The grilled chicken wrap was good in terms of taste and health quotient, but it needs a salad on the side too. In absence of a salad, this grilled chicken wrap feels too dry to eat even with the salsa it comes with. The salsa is avoidable, too sweet for my taste. The salads on the menu are good. The better thing is that you can always get your salad customized, ask for a particular dressing, more pepper or order some add-ons with it or have them as is. I had finished all the salads that came on the side of sandwiches so I did not order any more, but the options on the menu were all good. I must add that CBTL is a lively place, a bit slow service probably because it is quite crowded and you can see people waiting outside for a table. I could see people from all age groups, some really old people were chatting up on a corner table, a family with kids grabbing a sandwich on another and even a new mother feeding her baby on a table quite close to entrance. Especially the breastfeeding mother gave me very good feelings about a place as well as the comfort level a new mother has there. Coffee at CBTL is decent. We tasted a Blueberry-Mascarpone cheesecake that we could not tolerate for another bite. The much acclaimed cake-pops are best avoided. Never eat cake-pops at cafes, bakeries or any place that displays it. Not worth your money and your tummy. Now coming to the recipe of salad I am sharing today. This is one salad I repeat quite often when green garlic shoots are in season. I change the other vegetables sometimes and use mushrooms (quartered) or potatoes (boiled, cooled and thickly sliced) but the green garlic shoots are used in abundance. These garlic chives recipes will give you an idea how I use them for stir fry and cold salads. Garlic chives are lighter flavoured than these green garlic shoots. Check the pickled pesto recipe we call lehsunsagga too, you would love it. We love garlic and green garlic gives the best flavours of garlic with a good bite too. The trick is not to cook the vegetables too much for this salad and use loads of toasted sesame seeds or any other seeds or chopped nuts for added texture and taste. 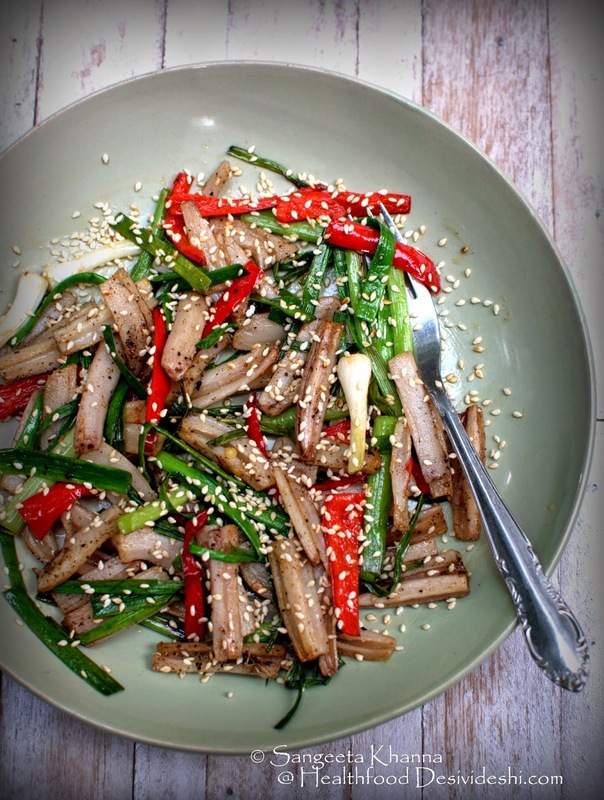 Note that there are no sauces or vinegar used in this salad, it is the taste of good quality sesame oil and the pungency of green garlic shoots combined with fresh red peppers that gives this salad the much needed flavour. Keep this in mind if you decide to substitute any of the ingredients. Clean and peel the lotus stem, cut into inch long pieces and then cut each piece longitudinally to make batons. Slit open the red pepper, remove seeds and slice into similar sized batons. Chop the green garlic shoots in similar sized pieces too. You might like to slit the base part if it is thick. Heat the sesame oil in a pan and toss in the lotus stem batons first. Add salt just enough for the lotus stem and toss to cook for a couple of minutes. Add the red pepper and toss for 30 seconds and then add the green garlic shoots too. Toss for a minute or till the garlic leaves and shoots become limp. Take off the heat, adjust seasoning and empty the salad in a serving platter. Sprinkle toasted sesame seeds and serve right away. The salad is very filling and tasty. You may want to use a bit more sesame oil to make the salad more flavourful. I don't mind using such good quality oils liberally for such salad meals. If you are serving this salad to a crowd, make it in huge amounts because this will be the one salad that everyone will keep taking second and third helpings. The salad pairs really well with noodles, plain boiled rice or on the side of grilled fish or chicken. Fish or chicken can also be added to the same salad to make it more filling if you wish. Thinly sliced chicken breast or fish fillet works well for this salad. 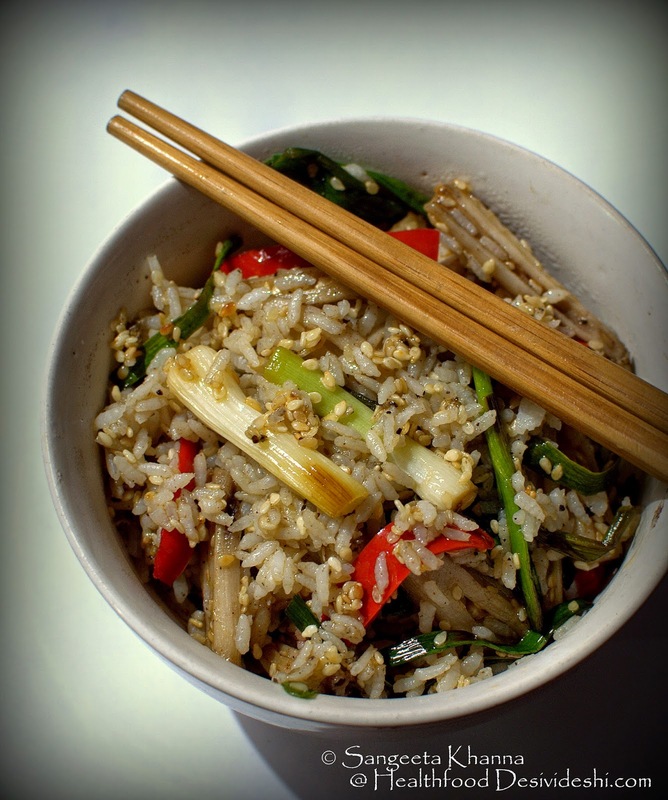 I make quick dinner with this salad tossed with some leftover rice sometimes. Many readers tell me that they don't get lotus stem in their part of the world. If you are one of those, try using mushrooms, boiled potatoes, peeled and chopped raw plantains or even yams for this salad and see if you like it. But please don't substitute cold pressed sesame oil with anything else for this recipe. 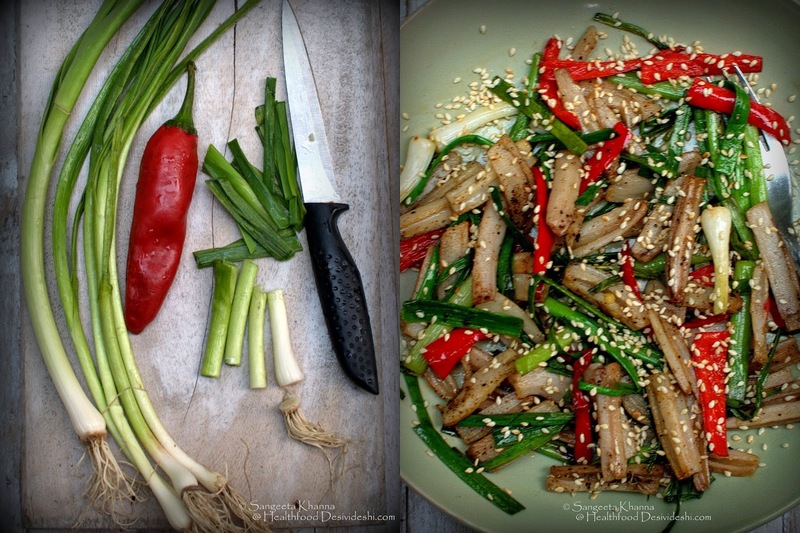 Sesame oil is the soul of this lotus stem and green garlic salad. And toasted sesame reinforces the sesame flavours even more. 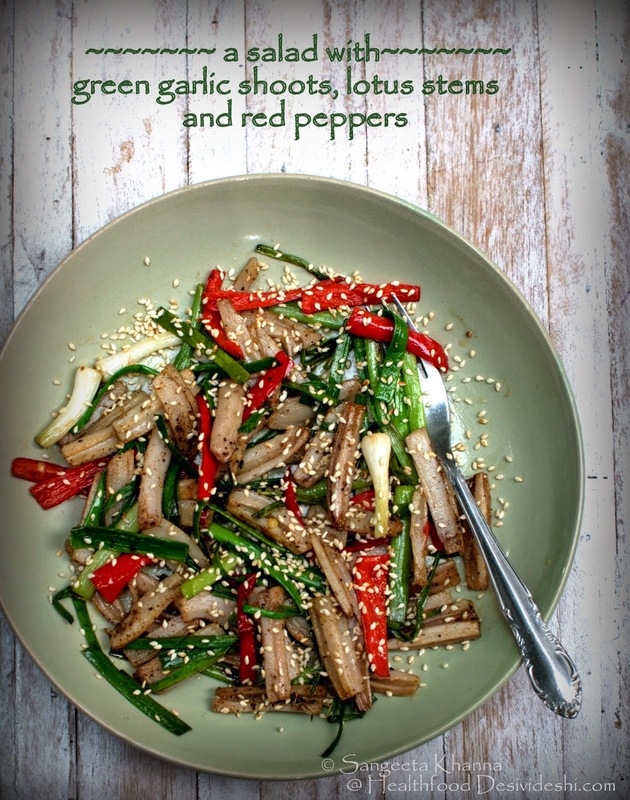 You can even serve this lotus stem and green garlic stir fried salad as a subzi with Indian meals too. I have a feeling I would like it with khichdi or daal chawal or even wrapped in a thin whole wheat roti too. 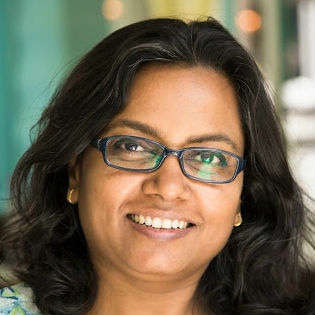 Happy New year Sangeeta. This new year planning to read and catch up through blog. I somehow started missing those times prior to facebook. great tips as usual but for many reasons we have minimised eating out. and food at home means tuck loads of veggies in it. one thing we are tying to add more to our daily diet this year are the fruits. I have been following your tips of preparing fruits in the morning and stocking in fridge for the day's consumption but somehow my family always prefer savoury taste over these. I am glad my tips on healthy eating are helpful but if your family doesn't like fruits on their own, why not making fruit chats with them? Or just toss salads with colorful vegetables. I would be waiting to know hat solution you bring for them, I might post a few suggestion here soon. Thanks for the feedback always. I am too a huge fan of all sorts of different salads. Can't wait to try that gorgeous lotus root salad. I don't know which part of the world you are based Coral. Lotus stem is available in most south Asian countries. 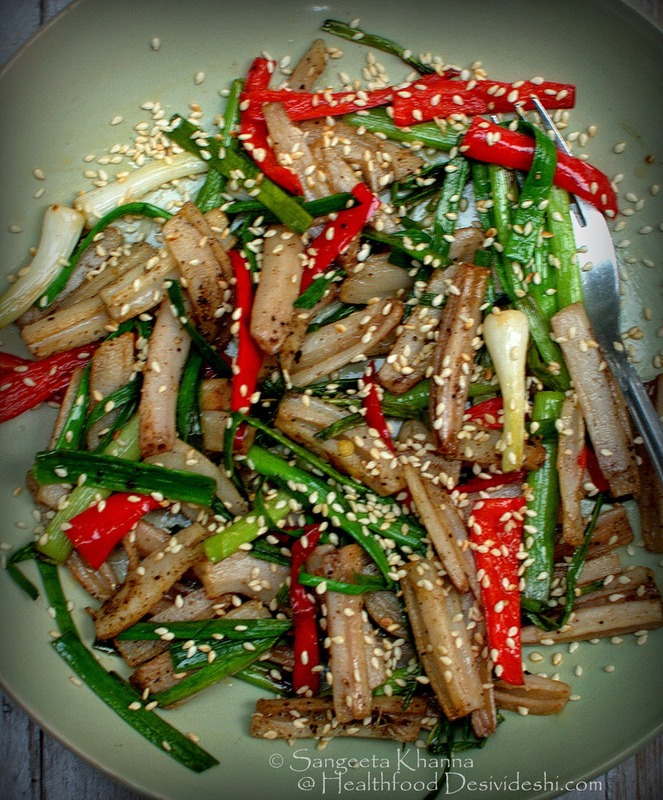 So glad to know that your kids loved this lotus stem salad too. Thank you for letting me know Richa.